We heard those six words repeated probably a thousand times in high school (well, maybe not a thousand, but a lot). The reason for this was our mom took our school lunches seriously … so seriously that we rarely went to school with a packed lunch. Mom made and delivered our lunches from scratch every day. Call us spoiled or whatever you want – we don’t care – because our mom knew how to show love to her hungry puppies. From the moment our screen door slapped behind us in the morning to thirty minutes before the noon lunch bell, our mom was at home working away in our closet-sized kitchen, whipping up a lunch fit for King Solomon’s table. Although she didn’t have the budget of a king, she put together some of the best lunches two growing boys could ever have – all neatly packed into Tupperware containers. When 11:30 rolled around, the hunger hounds in our teenage stomachs had moved from barking to straight up howling. The minute we heard the bell we’d dart outside, shaking with anticipation to see what mom had concocted. We couldn’t wait to see her. We only lived a mile from our school – Garland Christian Academy – so Mom would pack away all her little Tupperware containers into a big cardboard box, put Johnny and Abby in their double stroller, and walk our lunch to school. Whichever kid sat in the front held the box. All of our buddies along with us waited outside the cafeteria waiting to say hello to her and the kids. She’d then hand off the box while our friends hugged her and the kids. She’d have this big smile on her face, like she had just run a race and came out victorious. She never really said much, but we could tell from the look on her face she loved doing it. This, to her, was living – and it was a way she brought a little bit of heaven into our lives. Looking back, we can see that this simple act of faithfulness fueled our mom – to know that her boys were taken care of and she was appreciated for it. That’s it – so simple, but so powerful. She wasn’t trying to save the world; she was just faithful right where God had placed her and to the people He put in her life. Oswald Chambers once said, “A river touches places that its source knows nothing of.” Our mom reminds us of the mom in Scripture who was faithful to pack a lunch for her son that Jesus would unpack and use to fee over 5,000 people. She was a source for her boy, and he was able to touch the lives of so many others when he gave what he had to Jesus. This mom was a bridge – an unsung hero who brought divine connection so the work could get done. Heaven connected to earth that day and peoples’ lives were radically changed because Momma was faithful to pack a lunch. Our mom was like this mom, and her life gives us a great example of what a bridge between heaven and earth looks like. It looks like a life of faithfulness lived out every single day in front of those who knew her best. There’s much more to the story of our mom, but you’ll have to wait until our book is released to read it. 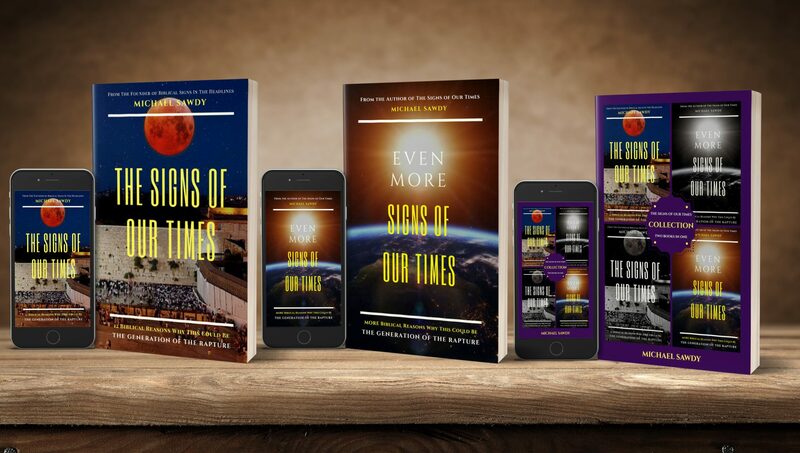 It's All About JESUS: The Truth About "Easter"
FINALLY HERE: Audiobook of "The Signs of Our Times" Has Arrived! 5777: Year Of The RAPTURE? Enter your email address to follow Biblical Signs In The Headlines and receive notifications of new posts by email.